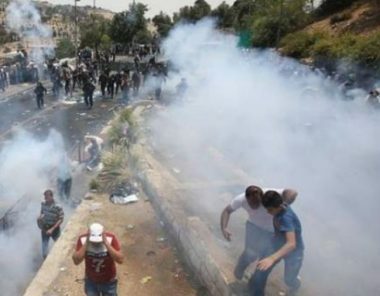 Dozens of Israeli soldiers invaded, Thursday, Ni’lin village, west of the central West Bank city of Ramallah, shot and injured one Palestinian, and abducted three others. The soldiers attacked dozens of Palestinians, who marched from the local mosque, and fired many live rounds, rubber-coated steel bullets, gas bombs and concussion grenades at them. Medical sources said the soldiers shot one with live fire, in addition to causing many to suffer the effects of teargas inhalation. The army also abducted three Palestinians, and took them to an unknown destination. Furthermore, the soldiers installed roadblocks, and prevented the residents from entering or leaving the village.